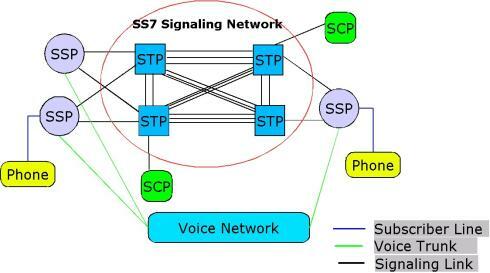 Common Channel Signaling System #7 (SS7) separates the information required to set up and manage telephone calls in the Public Switched Telephone Network (PSTN) onto a separate packet switched network (The Signaling Network) rather than use the same circuit switched network that the telephone call is made on (The Voice Network). This technique is commonly called out-of-band signaling and contrasts with earlier in-band techniques (Channel Associated Signaling - CAS) which used MF tones. The SS7 network consists of Signaling Points. SCP = Service Control Point: Usually deployed in pairs in case of failures. SSPs are switches, for example, Class 5 (local) and Class 4 (tandem) with SS7 interfaces. SSPs convert global title digits (a.k.a a dialed number) from a subscriber line to SS7 signaling messages. SSPs setup, manage and release voice circuits required to make a call. To summarize, an SSP's function is to use a global title to determine how to connect a call using its routing table. A call originates and terminates at the same switch (same SSP): No signaling messages are sent through the SS7 network. The SSP knows exactly where the destination is. A call originates at an SSP and is destined for a known SSP: In this case the originating SSP looks at its routing table to determine how to route the call then sends a message to the destination SSP using the ISUP protocol. This typically will only happen with Fully associated (F) links. A call originates at an SSP and is destined for an unknown SSP: In this case there are two possible scenarios. The global title (called part number) may be an 800 or a ported number. In this case the originating SSP performs a TCAP transaction with Global Title Translation via an STP to determine the point code of the destination SCP. The SCP will return a new Global Title. The originating SSP uses this number to route the call. The SSP routing table yields the address of an SSP (a next hop SSP) and the Call set-up sequence message (the IAM) is sent, via an STP, to this SSP which in turn will route the message to the next hop and so on untilthe mesaage reaches the destination SSP. An STP is a router and/or a gateway in the SS7 network. Messages are not originated by an STP. STPs switch SS7 messages between Signaling Points. If an originating SSP does not know the address of a destination SSP, the STP must provide it using Global Title Translation. Gateway STPs serve as the interface into another network and they can provide protocol conversion . STPs also provide traffic and usage measurements. An SCP provides application access. It is an interface to applications such as databases. An SCP communicates with applications using primitives. A primitive is an interface that provides access from one level of a protocol to another level. The protocol used to access and interface a database application is TCAP. Type A - Access Links (used to connect SSPs to STPs or STPs to SCPs). Type B - Bridge Links (used to connect paired STPs to other paired STPs). Type C - Cross Links (used to connect paired STPs). Type D - Diagonal Links (used to connect paired STPs at one in the hierarchy to paired STPs at another level in the hierarchy). Type E - Extended Links (used to connect SSPs to alternate or remote STPs for increased resiliance and load sharing). Type F - Fully Associated Links (used to connect SSPs when significant traffic flows between them). All links use the same physical connections (typically DS0A - 56K bit/s or DS1 (T1)). The letter designation allows differing congestion and recovery treatment. The standard SS7 protocol has 4 levels (layers) as defined in the OSI 7 Layer Model. The levels 1 to 3 constitute the Message Transfer Part (MTP) and level 4 is the User Part (Transport Layer in OSI). NOTE: TCAP, MAP and INAP are examples of services that use SCCP (list in SS7 glossary). SS7 uses three types of packets, called Signal Units (SUs) only one of which carries data. The Fill-in Signal Unit (FISU) is sent when the link is idle and allows the end-points to monitor signal quality and link integrity. The Link Status Signal Unit (LSSU) is sent when a link error occurs. Message Signal Units (MSU) carry protocol payloads such as ISUP, MAP etc. MTP1 defines the physical and electrical characteristics of the signaling link. The physical interfaces defined for SS7 include E-1 (2048kb/s; 3264kb/s channels), DS-1(1544kb/s; 24 64kb/s channels), V.35(64kb/s), DS-0(64kb/s) and DS-0A(56kb/s). MTP2 ensures reliable end-to-end transmission of a message across a signaling link that directly connects 2 nodes. Implements flow control, message sequence validation, error checking and error recovery. MTP3 provides message routing between signaling points in the SS7 network. MPT3 reroutes traffic away from failed links and signaling points and controls traffic when congestion occurs. MTP3 routes messages based on the Signaling Information Field(SIF) of an MSU. The routing label consists of the Destination Point Code(DPC), Originating Point Code (OPC) and Signaling Link Selection (SLC) field. When an MSU arrives at an SP and the DPC matches the point code of that SP, the message is sent to the appropriate user part (SCCP or ISUP). ISUP defines one call control protocol used to set-up, manage and release circuits that carry voice and data calls in the PSTN. ISUP uses the MTP for routing messages from one SSP to another. ISUP is the most commonly used call control protocol in North America and is used to illustrate the general points. There are a number of other call control protocols and national variants, for example, TUP (Telephony User Part), IUP (Interconnect User Part - UK standard). When a call is placed to an out-of-switch number, the originating SSP1 transmits an ISUP Initial Address Message (IAM) to reserve a trunk circuit from the originating SSP1 to the destination SSP2. The IAM includes the originating and destination points codes, the circuit identification code and the global title digits. The IAM is routed via the local STP1 of the originating SSP1 to the destination SSP2. The destination SSP2 determines if it serves the called party. If so it generates a ringing tone at the called party's line and transmits an ISUP Address Complete Message (ACM) to the originating SSP1 via its local STP2. The ACM indicates that the remote end trunk circuit has been reserved. 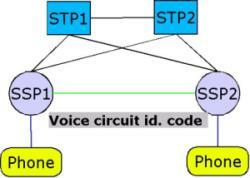 STP2 routes the ACM to SSP1 which generates a ringing tone to the calling party's line and connects it to the trunk circuit. When the called party picks up the phone, SSP2 terminates the ringing tone and transmits an ISUP ANswer Message (ANM) to SSP1 via STP2. STP2 routes the ANM to SSP1 which verifies that the calling party line is connected to the reserved trunk and if so starts billing. If the caller hangs up first SSP1 sends an ISUP RELease message (REL) to release the trunk circuit between the 2 switches. STP1 routes the REL to SSP2. Upon receiving the REL SSP2 disconnects the circuit from the called party's line and transmits an ISUP ReLease Complete message (RLC) to SSP1 to ack the release of the trunk circuit. When SSP1 receives the RLC it terminates billing. If the called person hangs up first, SSP2 sends a REL to SSP1 indicating the release cause. When REL is received, SSP1 disconnects the circuit from the caller's line and transmits an ISUP ReLease Complete message (RLC) to SSP2. When SSP2 receives the RLC it terminates and stops billing. SCCP provides connectionless and connection-oriented network services via MTP3 for the transfer of signaling messages between SSP's. While MTP3 provides point codes to allow messages to be addressed to specific signaling points, SCCP provides Subsystem Numbers (SSN) to let messages be addressed to specific applications at these signaling points. MTP transfers messages node-to-node while SCCP transfers messages end-to-end. SCCP is used as the transport layer for TCAP based services like, freephone(800/888), local number portability and roaming. SCCP also provides the means by which an STP can provide Global Title translation. Because an STP provides global title translation, originating SSPs do no need to know the DPC or SSN of the associated service. only STPs need to maintain the tables of destination point codes or SSNs associated with specific services and possible destinations. TCAP messages are destined for application entities. TCAP is designed for non-circuit related messages. TCAP provides a means for SCP-to-SCP communication via STP's. TCAP messages are used by SSPs to query an SCP (via an STP) to determine the routing numbers associated with a global title. The SCP uses TCAP to return a response containing the routing numbers back to the SSP via STP. TCAP messages are transfered end-to-end using the services of SCCP. TCAP is not limited to database access, it is also used to invoke other features from remote switches. TCAP services include freephone, calling card, and wireless roaming. In SS7, a dialed number is referred to as a global title. If the SSP does not know the destination of a global title, it sends a query in the form of TCAP messages to its local STP. When the query gets to the STP, the global title digits are given to the STP's SCCP. The STP will then translate the SCCP address fields and determine, through its own translation tables the address of the application (SCP). The Global Title Translation provides the SSN of the database and point code of the SCP that interfaces that database application. SSPs do not know the addresses of SCPs.